Stay powered up while you’re on the go with built-in USB charging, and toss out that unnecessary charging dangle. Track your daily activities including steps, heart rate, calories and sleep. Android and iOS compatible with quick access to notifications, phone finder and music control. Snap the perfect group selfies with a simple tap or shake of your wrist; no selfie stick needed. 2015 tom’s Guide top pick. PHONE CONTROL: Receive Phone Notifications, Music, Control Phone Camera From Watch & Phone Finder. RUGGED & DURABLE: Water and Dust proof. Great running watch. 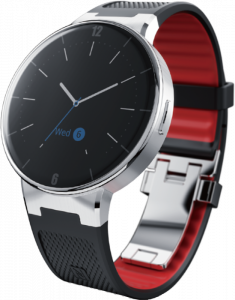 To track your activity, control your phone, and much, much more, please visit http://move.alcatelonetouch.com. PIXI 4, the big brother of the PIXI 3 best-seller, offers clear, sharp shots for the best selfies, along with exclusive Polaroid filters, a powerful music experience with sound backed by Arkamys, and a super slim, seductive design. 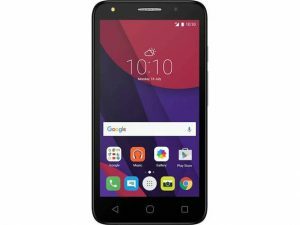 Plus, it’s powered by a reliable battery, and features fast connectivity, an easy-to-use interface, and quick, responsive performance with the powerful Quad Core 1.3Ghz CPU. PIXI 4 is the perfect first step in a whole new world. The larger screen makes this phone ideal for watching movies, playing games and playing online casino apps all from the palm of your hand. The PIXI4 display is perfect for viewing multiple windows at one time, as well as watching movies and playing games. And with two size options lets you choose the phone that suits your needs precisely. From the ultra-compact 4 inch display to the truly immersive 5 inch model, we’ve got you covered. 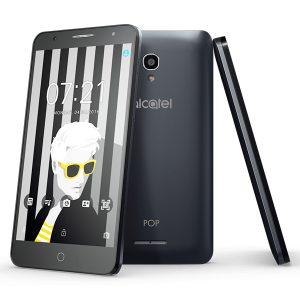 Aimed at the most POPular amongst us, POP4 is a 4G smartphone with a premium design and a slim body. The 5” or 5.5” full lamination screen enables perfect images and videos. The front flash & wide-angle 8Mpxl camera with f/2.0 aperture and 5Mpxl front camera with front flash & wide angle, provide an advanced camera experience even in low light…Hello selfies! Watch your movies POP on the stunning 5″ black crystal display, which is fully laminated to give vibrant colourful images. Are you a hoarder? Don’t sweat it. so you’ll never have to fight for space ever again! With wifi and 4G capabilities, POP 4 puts you in the fast lane for ‘always on’ uninturrupted streaming and gaming connectivity. And with the latest Android software, you can download all your favourite apps and games to turn it into your own personal entertainment system. Always-on connectivity, you can upload images and publish social posts anywhere, anytime. Just go easy on the hashtags. Stunning display, Pro-like cameras,Interactive shots and selfies, Powerhouse sound, 300% Reversible, Most Innovative Interactions: Live UI and Boom Key The uniquely designed IDOL 4 takes everything up a notch with a new Boom Key and an augmented multimedia experience. The Boom Key delivers an innovative user experience by offering custom-made features for taking photos, listening to music, the user interface, using web casino apps and gaming. The IDOL 4 offers a stunning display, pro-quality camera and premium audio The IDOL 4 is reversible in three ways: sound that goes from left to right, front to back and a user interface that works upside down. 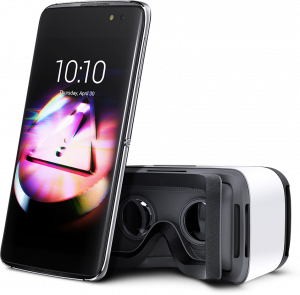 IDOL4 offer an augmented multimedia experience. interactive 3D shots and selfies combine to a 2k Amoled screen and pro-like cameras. Boosted sound by dual speakers and Maxxaudio optimisation by Waves. Discover more sensations in your hands! Try unexpected effects on your photos, games, videos and music. Press it and boost your sensations. Boom your smartphone now! IDOL 4 comes in a revolutionary packaging. Open it and discover some amazing Virtual Reality goggles inside. Put them on and discover a new reality! Idol 4 comes in 2 different sizes, with a gorgeous colored metal frame in Soft Gold, Dark Grey, Rose Gold, or Metallic Silver. Make your choice!